Anchored In Kobe: 完成されるか？ / Completed? Some readers are probably curious as to the outcome, last month. You can probably see from the graph that I reached the word limit. Yahoo! My official count on the last day was 52,027 words. I actually felt the invisible pressure from readers and my friends in the know who were probably expecting to hear about the results. It was great encouragement. Unfortunately, what I did write is in no state to be read by anyone. As you can imagine, it needs research and heavy editing. Moreover, the story isn’t finished yet! I’ve written the beginning and the end, but not the middle. 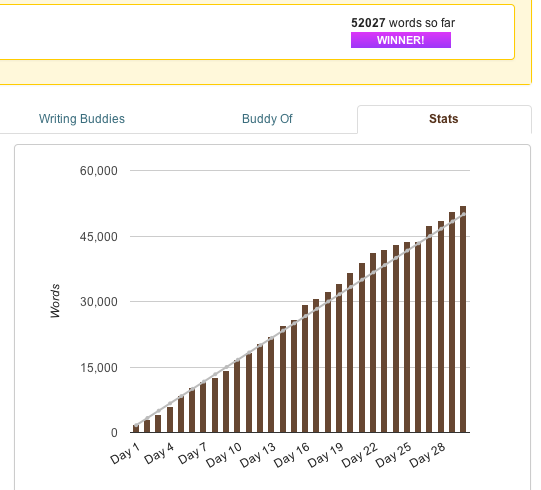 It will be interesting to see how long it ends up, but more importantly will I feel the pressure to finish it now that NaNoWriMo is over for another year? The Japanese version first appeared in the December 2013 issue of the goodspeed monthly newsletter.